'Tranquility by the Sea' is a bright and breezy cottage completely equipped with everything you will need to make your island stay comfortable and care free. 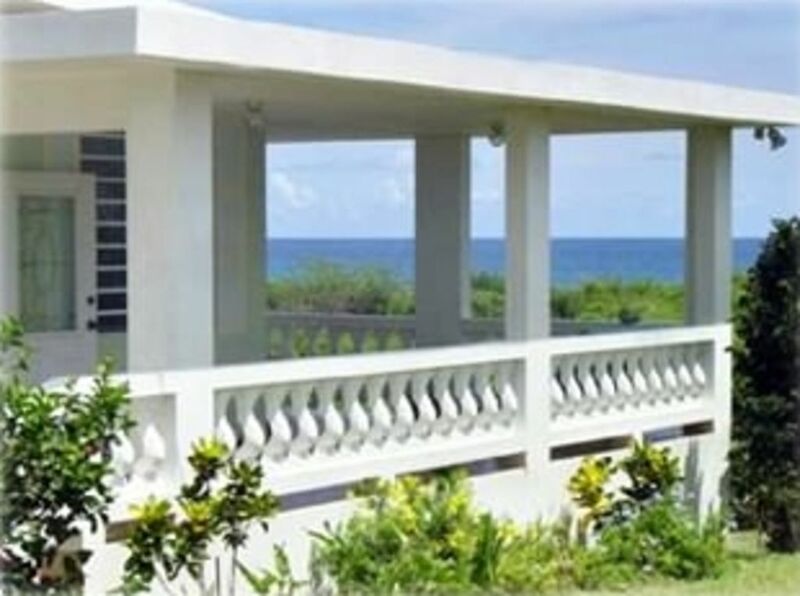 We offer a secluded one acre with lovely grounds and a great ocean view. Our cottage interior has high ceilings all fanned to keep the breezes flowing and our wide wrap around veranda is a favorite shady spot to relax and experience the trade winds that are ever present. There's lots of outdoor seating on the front veranda with tables for dining and a back patio is a cozy private space for wave watching and sipping a cool beverage. The mangrove lagoon directly behind the cottage is a nesting area for egrets and iguanas and other bird life. Hummingbirds abound when our flowers are in blossom and our purple water lilies are ever blooming in our old sugarcane cooker. Our location offers sights and sounds of island wildlife from wild horses grazing in the adjoining fields - Iguanas of course - and the island roosters. A long stretch of sandy beach is an quick 3 minute walk and it is great for long walks and scavenging for beach "stuff" - - and there is plenty for all. The closest town is Isabel Segunda and it's just a 25 minute walk or a 3 minute drive away. There are also two mom and pop grocery stores on the way into town. I am an artist - designer - who finds this special location an inspiration for my design work. This property is special to us as it's private and offers us the pleasure of enjoying wildlife. There are woods behind with a river bordering two sides but we especially love our beautiful ocean view and the daily visits from a herd of wild horses who graze between our home and the ocean. We never tire of the surprise of seeing a new colt accompanying its mother for the first time or a nest of egrets full of fuzzy baby birds in the trees behind in the lagoon. You might see everything from nesting egrets, horses, iguanas, hummingbirds, rooster families, mongoose - etc. on our grounds. It's bringing you nature - naturally! We are a quick walk to a sandy beach which offers a mile long walk. Sitting on our porch glider and watching surf and feeling peaceful with the sounds and sights of country living by the sea. The cottage is on a very private road where wild horses are more frequent than cars passing by.If you love wildlife - you have found Tranquility. We have a nice view of the ocean from our large veranda. You can even hear the roar of the surf when it's up and swatch the waves coming in as the tide changes. A lovely ocean view from front and back of the cottage. We have a Roku streaming device which has hundreds of free movies, many games, and tv shows. The owner is very good about keeping in contact. The managers met us and were very helpful. Everything in the house worked as expected. Quiet location outside of town. 2 or 3 miles from the nearest supermarket. Fenced yard was very effective at keeping the wandering horses out. Did have a random stranger come on the property and look in the window. He quickly left. I hope he was a friend looking for the owner. The name speaks for itself, Tranquility. The cottage is on a nice property. There are beautiful flowers and nice big palm trees. There is also a nice porch overlooking the ocean. The inside was clean and well appointed. There are plenty of cooking supplies as well as beach toys. The bags for groceries came in handy. We did not venture down to the beach close to the house as we were only on the island for 3 nights and really wanted to explore all the other beaches. The only inconvenience was the multiple locks we had to use when we left the house and at night. I realize we are on an island with a declining economy but I felt paranoid that someone would try to break in. Could be because there are horses roaming around and owner is just protecing her property, which is totally understandable. There is an animal shelter across the street and the dogs do bark at times. We were too busy exploring the island for it to really bother us. Gloria, the owner, sent Marcelle and William to meet us at the car rental. They showed us around which was very helpful. Off the Beaten Path with a great view. We had a wonderful time staying at Tranquility by the Sea. Gloria was great to answer our many questions and provide assistance with finding things. We were greeted by Marcell and William and they were so nice to show us the place and suggest things we might be interested in. We loved sitting on the veranda and having coffee in the morning. It was very nice. We enjoyed our time so much! The home was a comfortable fit for the 5 of us. I fell asleep to the rhythm of the ocean every night. Thank you for such a great get away! It is always a joy to have guests who appreciate the cottage and its' surroundings and look forward to them returning. you can walk a dog at the humane shelter next door., find a new beach to explore, or go shelling - snorkeling or scuba diving. The eateries are diverse and if cooking in is a favorite - the cottage is amply supplied with pots - pans etc. We pride ourselves in providing you with a clean - comfortable home to come back to after a day exploring and enjoying the island.